Sound Affects PremierGuitar Tech4 Reasons the BOSS GT-1000 is Awesome! 4 Reasons the BOSS GT-1000 is Awesome! The GT-1000 landed earlier this year and has been a key talking point amongst guitarists. After decades of advanced research Boss finally decided to throw all of their eggs in one basket and create the ultimate flagship multi-effects processor. The internet is alive with demo videos, reviews and in-depth tutorials to keep us occupied for hours. This blog intends to keep it simple by listing 4 reasons the Boss GT-1000 is simply awesome! One thing’s for sure, you will not get bored of the GT-1000. If you are the type of guitarist who loves presets or wants some inspiration look no further. 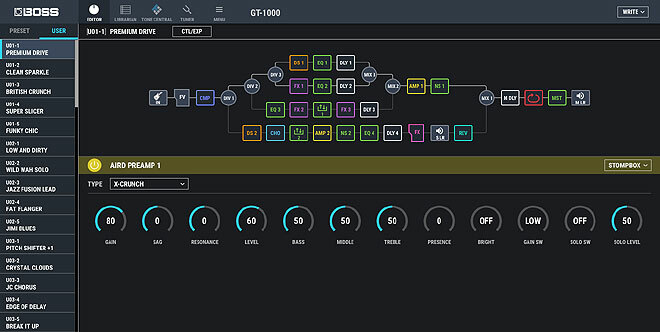 Not only is the GT-1000 packed with presets, you can also download additional patches via the ToneCentral website. From collections of classic rock song tones to presets created by artists such as Steve Lukather & Marty Friedman there is already an impressive collection of free content here that Boss intend to add to going forward (never mind the presets being shared by users via forums). 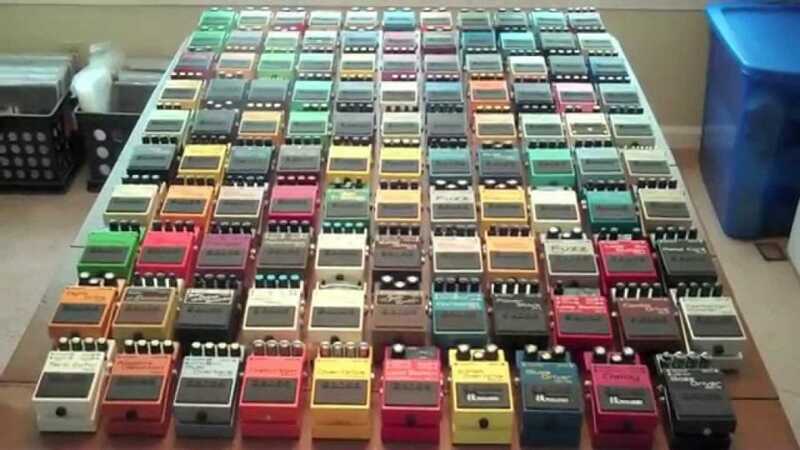 Imagine this was your pedal board…. There are 116 effects built into the GT-1000 so if you have ever wanted to collect all of the Boss pedals this is a much cheaper option. Not only does the GT-1000 include classics such as the DS-1, SD-1 & BD-2 it also includes the algorithms for the new RV-500, MD-500 & DD-500 pedals. All of these effects utilise MDP technology which react to a players technique and dynamics allowing further expression and a “realistic” feel. Having 116 effects pedals is one thing but you need some great amps to run them through. From natural/clean to high gain the GT-1000 has an ‘amp type’ to suit all genres. Not only do these amps sound great, they also react naturally thanks AIRD technology. AIRD (Augmented Impulse Response Dynamics) is based on Roland Boss’s acclaimed ‘Tube Logic’ technology allowing the amp models to live & breath like real tube amps providing an inspiring feel and authentic tonal dynamics that were previously unattainable. Are you a little put off by having to dial in your ideas using a pedalboards menu? The Boss Tone Studio software is great way create in depth patches, learn how your favourites were created and clearly see the signal chain for preset. Available free of charge from the Tone Central website, this is must have software for beginners and professionals to get the most out of the GT-1000. 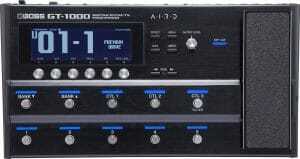 What really separates the GT-1000 from its competitors is its connectivity with other amps. Using the GT-1000 through a flat response speaker/PA will give you a HD sound and is where the amp models really shine. However if you want to run the 116 built in effects through your favourite tube amp you want to ensure you get the best tone possible with no further modelling affecting the sound. Using the GT-1000’s AIRD output settings you can easily choose what type of amp you are plugging into so that the GT-1000 adjusts the tone accordingly. This is perfect for players who want to continuing using their tube amps and sets the GT-1000 apart from other flagship multi-effects processors. Visit Sound Affects for full specs and demo reviews!